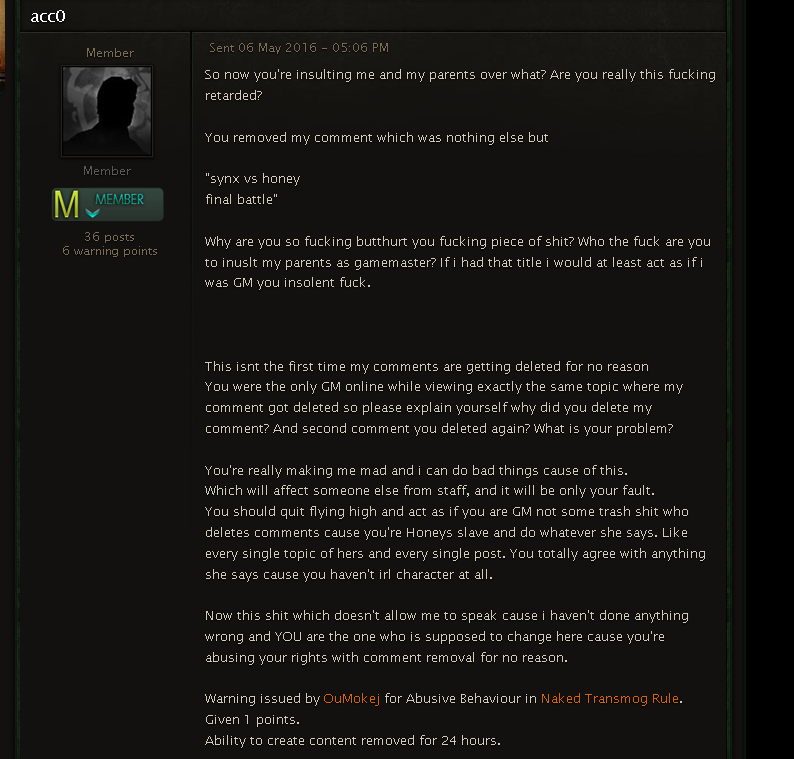 This is where i insulted him after i got 24hour mute and him insulting my parents because i asked him why my comments got deleted. If you really want to see, i'm not hiding anything. All in all the lack of possibility "to freely share any minds & thoughts" was a mistake which got corrected afterall, nevertheless according to what happend this whole "thing" can just start working if players as well as GMs taking this new rules as a basement especially in forum. And if some players won't be able or just simply don't want to stick to these rules they have to deal with the consequences. 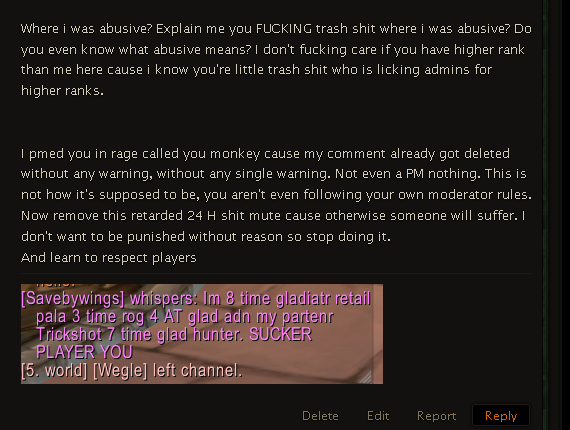 At least you answer and give somewhat decent answer unlike other gms which can't handle the situation so they remove posts and/or ban the player instead. And Bleedya according to whatever happend in the past between anyone, or even me, this conversation what you just posting, dont feel offended but why do you just show the parts of this conversations which are kinda an advantage for yourself, if you show these conversation, you should show the full conversation, including those parts where you starting insulting the named gm, independed on what happend before in addition even tho you don't like him at all i'd guess, he acts calm and wisely to your allegations and insults. I know this case, even tho i haven't watched it barely. As i said multiple times in my previous posts, it won't anything in the past, and i won't deny mistakes have been made, on both sides. But if we stick to the past, to start this "thing", it will never gonna work. That's why we simply won't. And everyone have to deal with this. By the way i won't repeat it once more, old cases are done. No matter what happend, cause this is the only chance how to solve the whole problem! What is this all about ? According to view some drama happen from the past ? Do I even have right to discusse ? In this case it is my last word and i will close this thread afterwards, otherwise it will expand to the endless spaces of this forum. Things happend, wrong decisions were made on both sides no doubt, but from now on, these rules are actively substain and people have to deal with these from now on or deal with the consequences. GMs won't ban without reasons anymore wether they did it in the past or not, this does not matter anymore. And these rules count for everyone! Thanks for this refreshing conversation and i hope for everyone to stuck with these rules, cause it ain't a pleasure banning people, EVEN for a REASON!